Got home last night and the girlfriend gave me a box, opened it up and it was a brand spanking now TomTom Rider 400! I think she saw me looking at them online and decided to surprise me with it. I'm heading into London on Monday to sort out my passport (It's like 10 years out of date!) so will let you know if it's actualyl any good! They do a stem nut with a threaded sleeve in. You then fit a RAM 1" ball to it and use a RAM arm and appropriate mount for your device. It's how I mount my Rider... easy to see and rock solid. Thanks for the link! I'd already started to look to see if there was anywhere local that actually sells them as I'll need it for tomorrow. I think I'll have to just put it in a temp place for tomorrow and then get on afterwards. Been looking through the features on this 400 and it's pretty damn good! Need to get myself a headset as this connects to my phone for calls etc! That was my first thought but wasn't too sure about it, but if you say it works I'll give it a try! Works fine with standard mirror stalks, if you have aftermarket mirrors then might be a different story. I will be wiring it all up this afternoon once I'm out of work. Not sure where I'm going to be putting these wires yet but I'll find a route! I might even take a picture of the thing all mounted up. @Ondurin wrote: I will be wiring it all up this afternoon once I'm out of work. Not sure where I'm going to be putting these wires yet but I'll find a route! I put it on the wing mirror stem and it worked for what I needed it for but I found it was just in the damn way and got covered in London's road gunk. I'm going to buy the steering nut adapter as it looks a lot more practice. This is how mine is mounted, doesn't get in the way or covered in crap but then there is all the salt on the road that gets everywhere. I think I know why I don't like mine there compared to yours, the TomTom Rider 400 is massive compared to that one! Fair enough lol. I have the zumo 550. So pics below, Ignore my Mazda in the background in fact ignore my new house.... Damn place is covered in mud, I do hate this development site! As you can see the TomTom 400 is a big boy! I'm really tempted to move it to the steering stem still. As soon as you put that on a yoke mount it will block the dash, plus you'll be looking down a fair bit to see it. Have you tried to pivot the top ball joint rather than the first. Might be enough to give it height and keep it out the way a bit more. On a side note are your grips on the wrong sides? If you use a short mounting stem it won't block the instruments but yes, there is a bit of looking down involved if you move to the top nut. It works OK for me and has the benefit that it keeps the unit out of the worst of the weather, behind the screen. @The White One wrote: As soon as you put that on a yoke mount it will block the dash, plus you'll be looking down a fair bit to see it. Have you tried to pivot the top ball joint rather than the first. Might be enough to give it height and keep it out the way a bit more. I'll mess around with the location a little and see if I can't maneuver it into a better position. I don't mind looking down once in a while as I'll be getting a bluetooth set to pair with it soon. Grips are correct afaik. I'm changing them soon as these ones hurt my hands. @weasley wrote: If you use a short mounting stem it won't block the instruments but yes, there is a bit of looking down involved if you move to the top nut. It works OK for me and has the benefit that it keeps the unit out of the worst of the weather, behind the screen. If I'm not mistaken the tom Tom rider ones have the speedometer display too don't they ( correct me if I'm wrong) in which case it wouldn't matter if it blocked view of the instruments as you will see your speed on the sat nav? 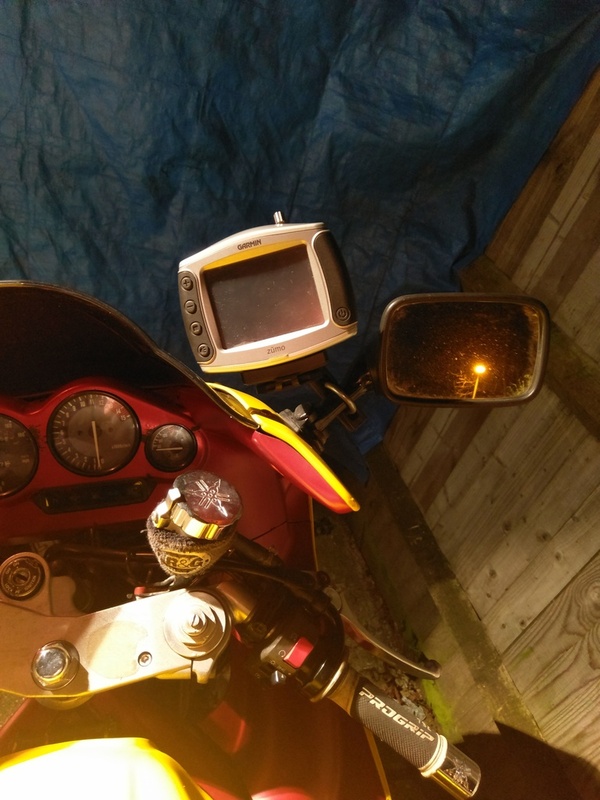 @dudeofrude wrote: If I'm not mistaken the tom Tom rider ones have the speedometer display too don't they ( correct me if I'm wrong) in which case it wouldn't matter if it blocked view of the instruments as you will see your speed on the sat nav? This one does indeed have a speedometer on it, as well as live camera locations and traffic updates (I've linked it to my mobile), So I guess it wouldn't matter if it blocks my instruments too much. Just my old, I would have had the Yamaha facing up towards the rider lol.